ADELAIDE, Australia, September 3, 2015 (ENS) – Grape marc, the skins, stalks and seeds left over from winemaking, could be turned into a vehicle fuel, researchers at the University of Adelaide have found. According to a study published in the journal “Bioresource Technology,” the Australian researchers showed that up to 400 liters of bioethanol could be produced by fermentation of one metric ton of wine-making waste. Biofuel researchers around the world are experimenting with a variety of materials – including municipal solid waste, fruit pulp, corn stover, cotton seed, biochar and various forms of algae – but this is the first time grape marc has been used as the raw material for a biofuel. “This is a potentially economic use for what is largely a waste product,” says Associate Professor Rachel Burton, program leader with the Australian Research Council Centre of Excellence in Plant Cell Walls in the university’s School of Agriculture, Food and Wine. “We’ve shown that there is a potential new industry with the evolution of local biofuel processing plants to add value to the grape for an environmentally friendly biofuel,” Professor Burton said. PhD candidate Kendall Corbin analyzed the composition of grape marc from two grape varieties, cabernet sauvignon and sauvignon blanc. She also investigated pre-treatment of the grape marc with acid and enzymes. Corbin found that the majority of the carbohydrates found in grape marc could be converted directly to ethanol through fermentation, with a yield of up to 270 litres per tonne of grape marc. The leftover product is considered suitable for use as an animal feed or fertilizer, although Craig Miller of Dairy Food Safety Victoria warns that it may contain residues of agricultural chemicals sprayed in vineyards to control pests and fungal diseases on the grapes. That risk is not a factor if the grape marc is used as a feedstock for bioethanol. 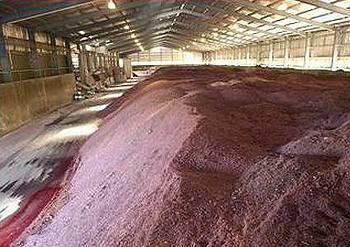 Ethanol yields could be increased by pre-treatment of the grape waste with acid and enzymes, up to 400 liters a tonne. In Australia, it is estimated that several hundred thousand tonnes of grape marc are generated annually. 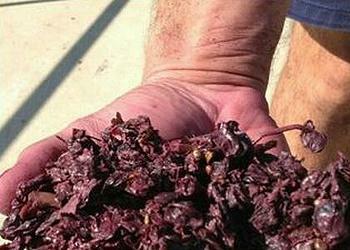 It is currently disposed of at a cost to the producing winery, the researchers say. Tarac Technologies, a company in South Australia, processes approximately 120,000 tonnes of grape marc a year, around 78 percent of the total Australian wine grape crush.